I’ve lived on or near Capitol Hill for some time now. I often refer to it as “the hill,” though I’m clear on the fact that there are 7 different hills here in Seattle. It’s just the only one that matters...to me. Sometimes it’s tempting to wrap ourselves in our own little world, surrounded by those who think just like we do. 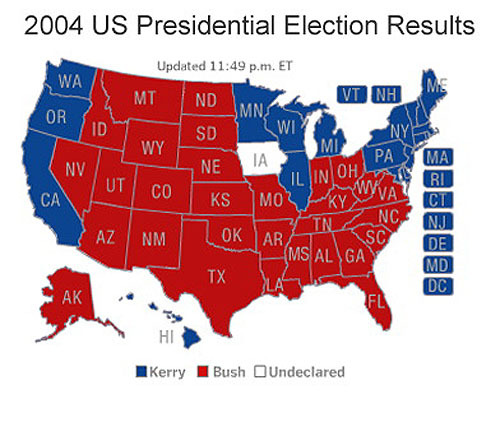 Remember 2004 when you didn’t know a single person who voted for George Bush and wondered how on earth the man got elected?! 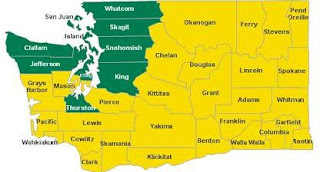 (King County went nearly 65% for Kerry) Immediately following the election we began to see vivid maps of blue coasts and the red heartland, accompanied by half-hearted threats of secession from blue-staters. I remember feeling so far removed from the thought process of someone who believed that four more years of what we’d experienced was a good idea. "There's two sets of values in Washington.” Says Larry Stickney of Protect Marriage Washington. “There's values in Seattle, and there's the rest of us." I think it’s easy to buy into the color-coding of values. But are we really that different? Do we actually live inside of these red/blue dichotomies? Or is our reality closer to a shade of purple. In any case, it’s vital that we talk to everyone, everywhere about the importance of equal rights. Whether you’re in the presumably safe haven of a Capitol Hill coffee shop or in the middle of nowhere .